I walked through the carboot flea market and saw this oak cabinet for sale. The man I know over the years proceeded to tell me the history of how he came about it which I took with the usual pinch of salt because the desk needed no explanation as to how it came from London to be in this venue in North Wales. My first glances left me wondering if it was a good quality oak veneered plywood with sawn veneer facings but I soon considered it more likely to be solid oak all the way through. We talked turkey (that’s Texanese for money and such) and I sought of set it aside for thought as I had then found an old Regency writing slope that needed help. I looked at the writing slope more for the lovely brass hardware and for a £5 note it was well worth the money. Eventually we ended up at £30 for the desk and box combined and John and I carried them to the car. In the workshop the investigation began. 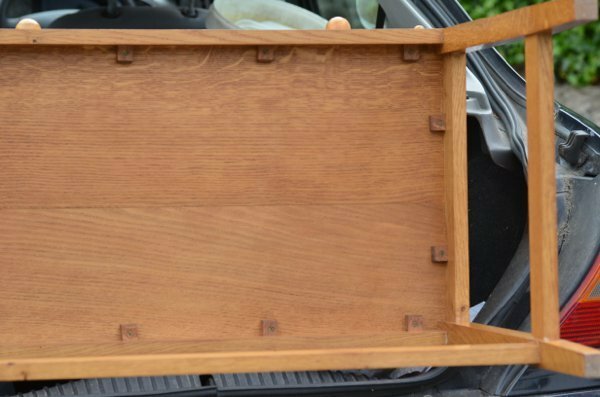 The carrier frame was mortise and tenoned which I already knew at the carboot. One of the joints had opened up and the others were visibly moving under the weight of the top desk section. The thing that struck me about this piece was the knife marks in the layout of different parts. 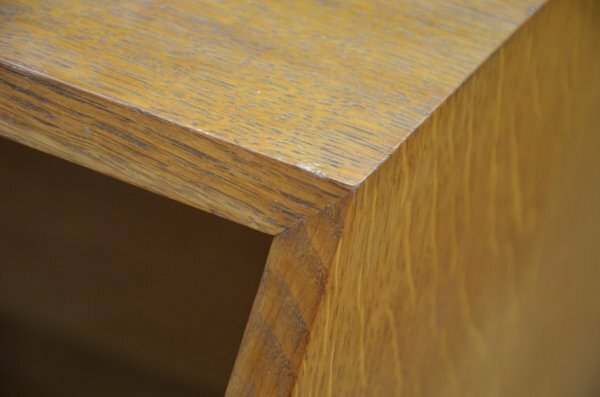 Crisp and pristinely cut shoulder lines left traces of the knife wall and though I suspect some of the joints were machine cut, through or common dovetails, half-lap and secret dovetails captured in near perfect mitres were not. This plane fall-front desk was a well executed work and were I to make it today it would cost me here with the UK prices of oak about £200 in quarter-sawn oak. The joiner on the desk itself was still solid and I am guessing the age of the piece to be around 50 years old. It’s a little utilitarian looking but in functionality perfectly sized. My wife will love it for her university work after I have pulled it apart and regaled everything. What were the telltale signs that told me so much before I bought this piece? Well, first off the mitres at the top corners. I could see no evidence of hardware, no signs of covers or plugs and the corners could not be flexed in any way at all. It spoke of a secret dovetail inside the mitre. Then, looking inside and out, I could see faint traces of knot on the outside and undulation on the inside. 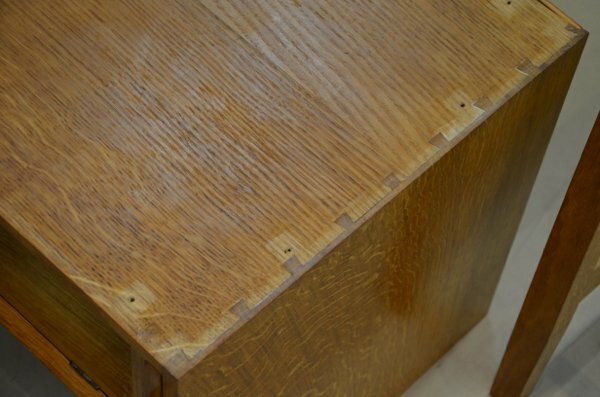 The drop leaf door/desk top was obviously solid oak with it’s raised panel and i could move the floating panel slightly and see the continuous grain in the tongue inside the frame. 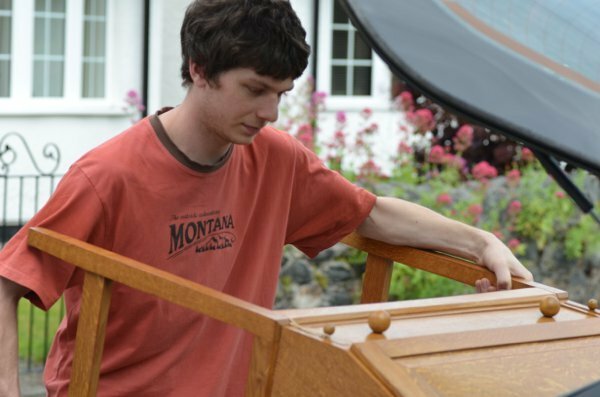 Turning the cabinet on its back into the car I saw the turn buttons clearly hand made and pocketed into the mortises. Very neat work. I wish the man had signed it somewhere but alas he had not. 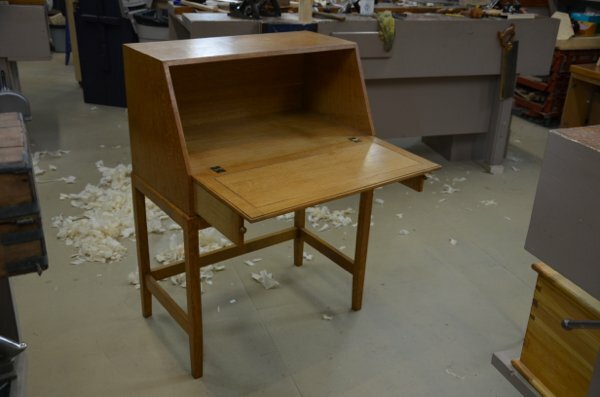 I was so glad to have rescued this desk from a student let landlord or landlady. Bangor is a university town and furniture gets swallowed up in lettings. Dismantling the top from the framed stands revealed that each turnbutton had been numbered to the relevant hole for the first five buttons dan then the buttons alone were numbered after that I suppose because t was unnecessary to number further in the holes as at the beginning. 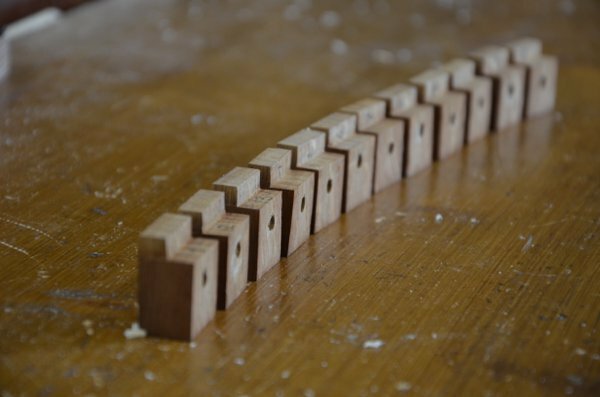 Once separated the half lap dovetails became perfectly obvious. They weren’t perfectly executed here but more than adequate. This is the regency writing slope. Good find Paul you always manage to find something of value and then get it for a bargain price. Very nice. I’m supposed to be planning my final piece and I’ve wondered about a writing slope as I can include a hinged element, lock and a drawer, and it is small enough that it won’t clutter up our tiny apartment too much. I look forward to seeing this one in more detail. This one is somewhat plain I suppose but it’s well made in general. I am a little suspicious of the loose tenons and suspect that the rails may not have been as dry as they should or were actually made too loose in thickness. It’s an easy fix, but usually something like this shouldn’t have failed at so young an age. It will be interesting to see what glue was used and also where else failed joints might be. The dimensions seem very nice although I might have liked just a tad more heft to the carrier frame. 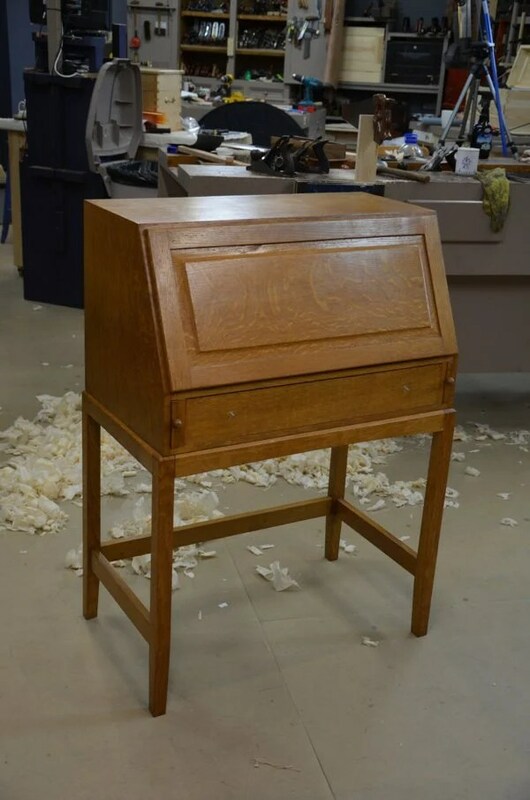 The back and drawer bottom are plywood and I may replace these with solid oak before I conclude the restoration.I respect the choice and challenge of the secret dovetails to the top corners and the clean lines this gives, I think I might have preferred the top to overhand the sides. What is very apparent is the use of sharp chisels and planes that show in the ‘behind-the-scenes’ parts like the turn buttons and shoulder lines. Every aspect and facet of the turn buttons is flat, square, unmachined and chisel or plane cut. I will look at them more deeply soon but I was impressed. Perhaps this is what you can bring to your exam piece Andy. That’s what I would be looking for and looking at. How do you avoid damaging the piece as you take it apart? Isn’t it glued? If it’s animal glue it will usually split-fracture in the glue line, but it can be risky. In this case the glue lines seem to be already broken and so should readily part for regluing and making good. PVA will dissolve with meths though and almost any glue outside of epoxy can be resolved, which is why we never use epoxy for restoration work. 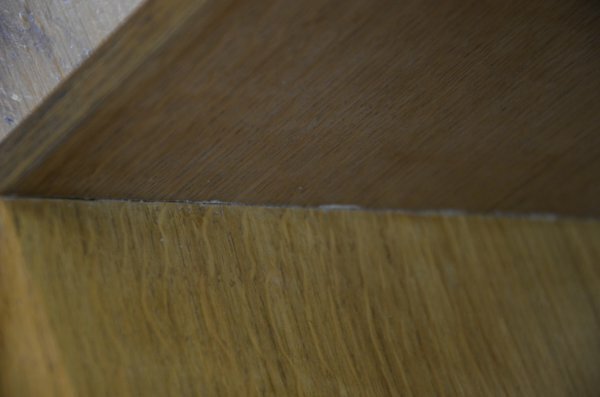 PVA as a glue is a good and strong adhesive used throughout the woodworking industry but it is harder to part. I have a feeling this one is hide glue as I said. You said PVA can be dissolve with meths… Well, as I suppose it is not meth crystal, can you tell me what is it please? Paul nice find, I know you said the desk is some what plain but I like it, and of course I love old boxes. That desk might make a nice project for your Master classes. Will be anxious to see the final restoration, and for me I like and use Hide Glue a lot. Paul, do you think there may have been a pigeon hole insert in the top cavity, as originally made? No signs of any such thing which did surprise me. The drawer interior is sparse too with no dividers or pen compartments. All of that makes it ideal for a laptop though. What lovely pieces, I wish one could find things this nice at our local “boot” sales. That desk is wonderfully simple and yet solid looking and writing slopes are always novel. Thanks for sharing and please keep us abreast of the restorations. Thanks so much for helping us learn to see and read pieces….very much appreciated. Greetings from TX. Hey Paul, I was wondering about that writing slope…can we see some shots of the insides? Does it contain hidden compartments like others I’ve seen? It would be really cool to see a breakdown on what joinery was used on it. It’s pretty well shot up and destroyed inside and the outside looks better in the picture than it is. i only really wanted the hardware of it. 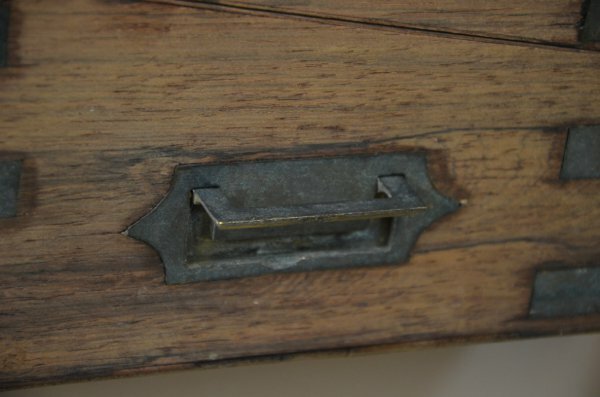 It did have secret compartment that’s pretty well standard with Regency rosewood writing slopes and the brass mechanism is still there. Paul, This is a prime example of why subscribing to your site is well worth the money. 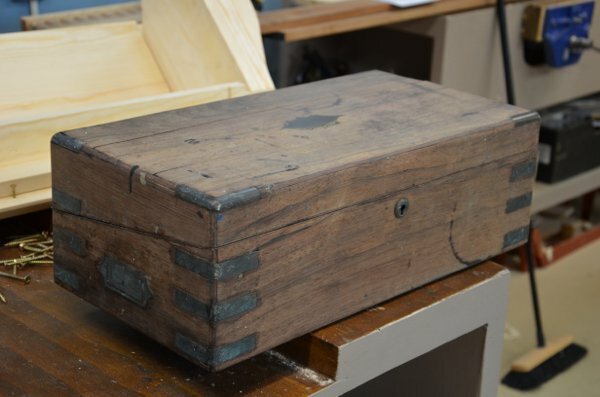 I’ve been reading/subscribing to about a half dozen woodworking magazines for about 10 years and have never seen The dissection of a second hand piece of furniture like you have done. This is so instructive and enjoyable partly because it’s uncommon. Your writings and your approach are so refreshing especially compared to the commercialized publications for woodworkers. So very interesting you are. Please keep it up.